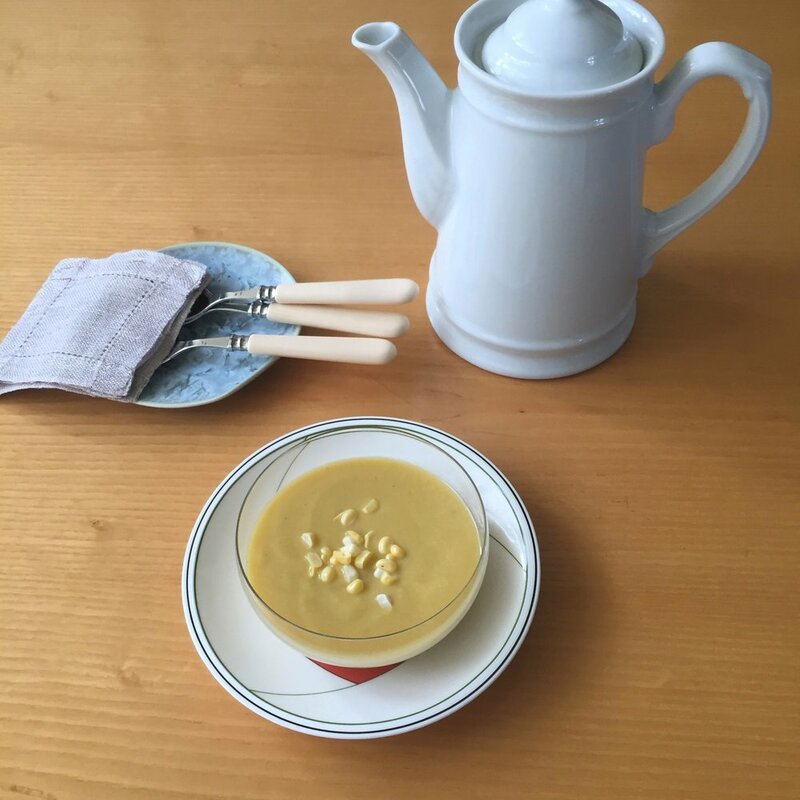 I love to make this soup in the summer when fresh corn is available. It is wonderful either cold or at room temperature. A slightly different version of this recipe first appeared in my cookbook, Helen Nash's New Kosher Cuisine. Rinse the tomatoes, remove the core, then cut them in half widthwise and squeeze gently to remove the seeds (some seeds will remain). Cut the tomatoes into pieces. Cut the jalapeno pepper in half lengthwise. Remove the seeds and cut into pieces. Heat the olive oil in a medium saucepan. Add the onion, garlic and jalapeno pepper. Sauté over low heat for about 5 minutes, until the onion is soft. Add the tomatoes, 2½ cups of the broth and corn. Bring to a boil over high heat. Lower the heat and cook, covered, for 15 minutes. Cool a little. Purée the soup in the blender until very smooth. Strain the soup through a medium-mesh sieve, pushing the solids with the back of a ladle to obtain as much puree as possible. Be sure to scrape the underside of the sieve. Discard the pulp. Return the soup to the saucepan and adjust the consistency as needed with the remaining broth. Adjust seasoning with salt, pepper, and lime juice. When seeding jalapeno peppers, I advise wearing thin, plastic gloves to avoid irritating your skin or your eyes. This soup freezes very well. When reheating, whisk it as it begins to boil to bring back the creamy texture.